City of Berks county, Pa. A few Jewish immigrants settled here before 1847, when Reading became a city. In 1864 a cemetery plot was acquired in the southern part of the city, and in the same year Congregation Oheb Sholom was founded with about fifteen charter members, most of them South-Germans. In 1884 a house of worship, located on Chestnut street, near Pearl street, was bought from the Evangelical Church, and, after being rebuilt, it was dedicated July 31, 1885, by Isaac M. Wise. A rabbi and Sabbath-school teacher was engaged; and Reform service of a moderate type was instituted. In 1897 Rabbi Julius Frank, the present (1905) incumbent, introduced the Union Prayer-Book and full Reform service. In 1898 the congregation bought another cemetery at Shillington, three miles from the city, the old one being vacated, and about sixty bodies were removed to the new burial-ground. Connected with the congregation are the Ladies' Hebrew Aid Society and the Ladies' Auxiliary. The Orthodox Jewish element, consisting entirely of Russian and Polish immigrants or their descendants, combined in 1887 and formed Congregation Shomre Habris. Their house of worship is located on North 8th street. A Hebrew Free School, situated on Moss street, is connected with this congregation. 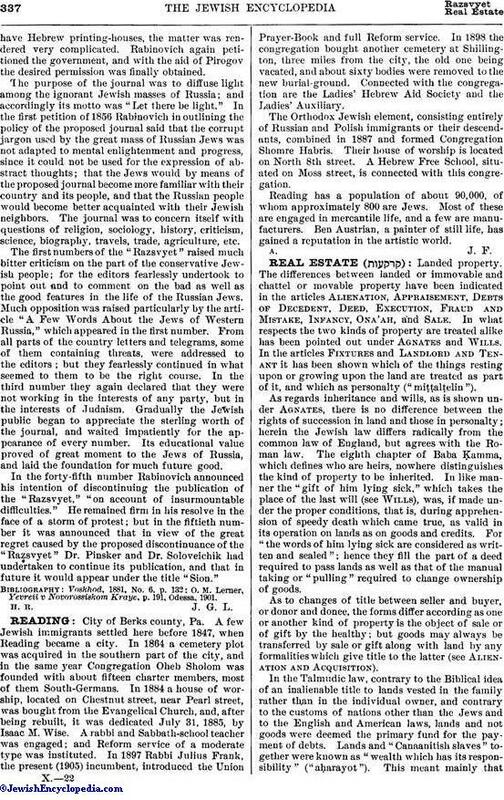 Reading has a population of about 90,000, of whom approximately 800 are Jews. Most of these are engaged in mercantile life, and a few are manufacturers. Ben Austrian, a painter of still life, has gained a reputation in the artistic world.